OpenChain, currently in version 1.1, is a project sponsored by the Linux Foundation to provide a centralized set of resources to create a specification, to educate about open source, and to self-check for conformance, all from a single site. OpenChain (not to be confused with a short-lived blockchain project of the same name in the United Kingdom) began in 2013 when Dave Marr, vice president and legal counsel at Qualcomm suggested it as a way to ensure open source compliance and best practices. The first release of the OpenChain Specification occurred in October 2016, but until the 1.1 release, the project avoided publicity in favor of testing and refining its resources. With the release of the 1.1 specification, OpenChain is also publishing a new web site and a publicity campaign to encourage the use of its resources. Already, four companies have self-certified with the 1.1 specification during beta testing – Siemens, Qualcomm, Pelagicore, and Wind River. OpenChain does not enforce its specification. Instead, in a concise 10-page document, the specification offers educational material covering such topics as the obligations of FOSS users, documenting FOSS, and interacting with the community, as well as overviews of how to apply OpenChain’s material to projects and businesses of any size. Accompanying the specification is a curriculum that discusses the basic concepts of open source software and a conformance questionnaire that those interested can take for themselves. “This service takes the pain out of becoming OpenChain conformant,” Coughlan says, “Any organization can access and process the questionnaire without cost. If they meet our criteria, they will join the OpenChain circle of trust.” The borrowing the term “circle of trust” from security keyrings is deliberate; as Jilayne Lovejoy, principal open source counsel at ARM, makes clear, OpenChain’s intent is to apply the collaborative spirit of FOSS software development to legal and best practices as well. Although the specification has been OpenChain’s main concern until recently, the project is also developing a curriculum for those who want to educate themselves about open source. The curriculum is in the form of a slide show, with a series of – so far – minimal notes. The curriculum continues with advice about monitoring the use of free software in an organization and identifying possible pitfalls. Not including title pages, each chapter is about half a dozen slides long and ends with a brief quiz about key concepts. Coughlan raises the possibility that, before the end of 2017, the quizzes could be offered independently to benefit “organizations that might be time-constrained.” Other training material might also be in the works. Noticeably, the curriculum is not nearly as polished as the specification. Yet, even so, it is more concise and free of bias than most material of its kind, and – having been released under the Creative Commons Universal or public domain license – is likely to find more uses beyond the OpenChain project. Until the release of the 1.1 specification, conformance has had the least attention of OpenChain project’s concerns. Now, however, “conformance has become a first-class citizen in the project,” Coughlan says. Currently, conformance takes the form of a self-administered test. When an organization passes the test, it can be listed on the OpenChain site to publicize the fact. 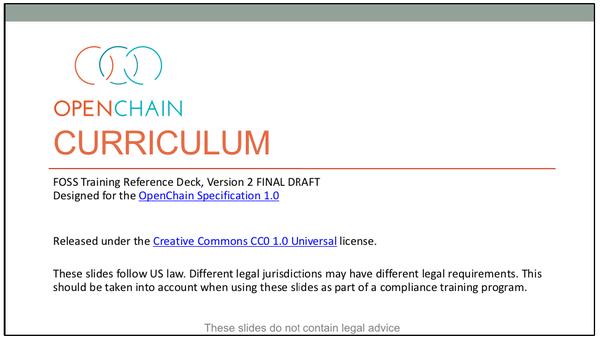 According to Coughlan, OpenChain is preparing a badge that organizations can display to announce their conformance. Clearly, OpenChain is just beginning. However, at this point, it appears to be off to a strong start.